Essential Qualification: M.Sc. 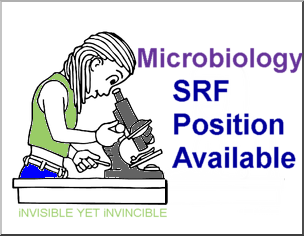 Microbiology with 2 years research experience. Upper Age Limit: 28 years (Relaxable in case of SC/ST/OBC/PH/Women candidate as per rules). Remuneration: Rs.18000 + 10% HRA per month. The appointment in the project is purely on temporary basis. The appointment will be made on consolidated pay initially for a period of 12 months, likely to be extended on the basis of their performance for next year till end of the study period. Interested candidates fulfilling the above criteria are required to submit their complete bio-data duly signed and enclosed with photocopies of certificates/testimonials in support of date of birth, qualification/experience etc. & affixed with latest photograph, by 06-May-2013 to the office of the undersigned. Interview of the shortlisted candidates will be conducted on a suitable date in the office chambers of the undersigned. Candidates will be informed accordingly. No TA/DA shall be paid for attending the interview.